KIM, junto Umbilical Design (nuestro homólogo bróker de la ESA en Suecia), participa este año en la coordinación, organización y desarrollo del International Workshop for Global Sustainability, que celebrará uno de sus talleres técnicos en Madrid, en la sede de la ESAC (European Space Astronomy Center) los próximos 3, 4 y 5 de junio. Actores punteros del sector aeroespacial internacional ( NASA, ESA, etc) y socios europeos de años anteriores colaboraron en estos encuentros, promovidos por PGS (Partnership for Global Sustainability) e ITB, Inc., organizando conjuntamente talleres técnicos en los que de intercambiar ideas para identificar y apoyar nuevas oportunidades de colaboración. Reaching for the sky leaves footprints on the ground. Through its Clean Space Initiative, ESA is pioneering an eco-friendly approach th space activities. On the ground, that means adopting greener industrial materials, processes and technologies. In space, it means preserving Earth's orbital environment as a safe zone, free of debris. Numerous analyses worldwide have shown the need for space debris removal, to contend with the proliferation of space debris. The only way to preserve key orbits for future use is tu shrink the current amount of debris in absolute terms, which will require novel technologies and approaches for the removal of debris and the design of non-debris creating missions. Since 2012, ESA'S Clean Space initiative has been sistematically considering the entire life-cycle of space activities, form the early stages of conceptual design to the mission's end of life - and even beyond, to removal of space debris. This panel session will focus on EcoDesign approaches for the space sector considered under the Clean Space Initiative. The space sector is growing as governments and private companies expand their activities. The global space community is beginning to acknowledge the need for and the competitive advantage of sustainable practices, including the development of technologies that minimize the impact of manufacturing and launches, increasing the use of renewable energy and reducing its carbon footprint and other environmental impacts. This session will discuss overall challenges and approaches th addressing sustainability in the space sector, including international approaches, economic impacts, green enginering, life-cycle analysis, material selection, research in the life sciences, earth observation, numerical modeling, development of novel, cost effective water treatment technologies and policy frameworks. Materials and processes historically used by the aerospace industry are continually impacted by environmental legislation. Domestic regulations and international agreements have banned or heavily restricted certain materials from future use or production, making it necessary to find replacements that comply with environmental regulations and provide equivalent performance. Replacing materials and processes with environmentally-friendly substitutes also moves the space sector toward an explicit consideration of sustainability in the development of new technologies. 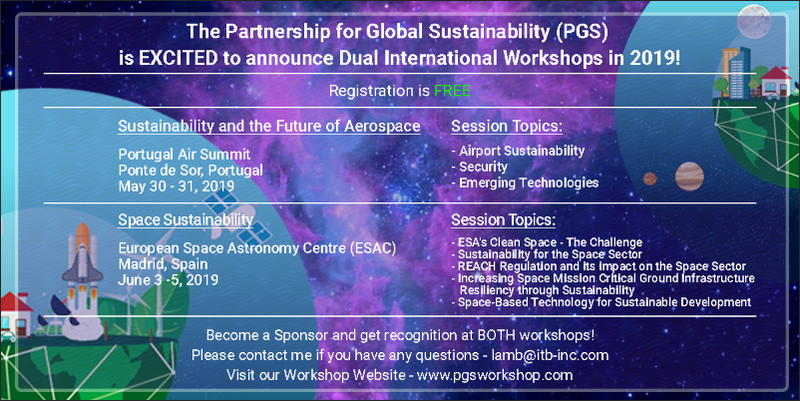 Topics will include the Registration, Evaluation, Authorisation and Restriction of Chemical (REACH) Regulation, Other environmental regulations with the potential to impact the space sector, evaluation of environmental impacts of propellants (i.e. liquid vs solid propulsion), effolrts to protect assets from corrosion, solvent replacement efforts, specific materials and technologies and fundamental research in materials science that can support a more sustainable space sector. The space sector depends on ground infrastructure to safely meet mission requirements. This session will examine ways that sustainable approaches to infrastructure planning and refurbishment can contribute to the resilience of the space sector's critical ground infrastructure. Geospatial and space-based technologies including satellite earth observation and communication, satellite positioning, microgravity research, and technology transfer can support sustainable development. As an example, satellite earth observation is a cost-effective way of obtaining data that decision makers can use to understand trends, evaluate needs, and create sustainable development policies. This session will explore spaced-based technologies and how they can support sustainable development. Las organizaciones también tienen la oportunidad de colaborar con el evento haciéndose sponsor en ese mismo enlace.